Preservatives come naturally and chemically synthesized. They work to stop the growth of harmful microbes, allowing food to remain safe to eat longer. People have been practicing preserving techniques for many centuries. The French submerge slow-cooked goose in its own rendered fat, cooling and storing to preserve. This is called a confit (pronounced con-fee) and is recognized as a delicacy, although it started as a traditional means of preserving meat in fat. Preserve fruits with sugar by making jam or candy. Sugar kills bacteria, or slows its growth, by drawing water away. Bacteria needs moisture to survive. Fruit naturally contains sugar in the form of fructose and glucose. Many recipes do not require you to add sugar in order to preserve fruits. Europeans have done this for hundreds of years, making pommé (apple jelly), poiré (pear jelly) and raisiné (grape jelly). Bring any kind of very ripe fruit to a boil, reduce the heat and then cook until the jam does not run off a spoon. Stir frequently. Pour jam into canning jars and seal with lids and rings. Turn upside down to sterilize any air remaining in the jar. The jam will keep for two years. Preserve fruit or vegetables by pickling with vinegar. In order to safely preserve food, vinegar must have an acidity level of 5 percent. For cucumbers, wash and cut firm fruit. Bring one packet of quick process pickling mix and 4 cups of vinegar to a near boil in a nonmetal or coated pan. Metal reacts with vinegar and can produce a cloudy pickle solution. 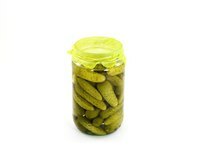 Pack raw cucumbers into canning jars and pour simmering pickle liquid over them, keeping 1/4-inch head space. Cover each jar with a lid and seal with a ring. Process with a water-bath canner, according to your canner's directions. Cure meat with salt, sodium nitrate and sodium nitrite. People have used salt to preserve meat and fish for centuries. Salt prevents bacteria by inhibiting growth. Commercially-produced sodium nitrite and sodium nitrate preserve meat by slowing the development of botulism and preserving color. Using too much nitrate or nitrite can be toxic so stick with a commercially-produced, premixed cure. Morton Salt makes home-curing kits you can find in the meat or spice section at the grocery store. Use only safe, FDA-approved chemical preservatives like sodium benzoate. For use as an antimicrobial and yeast-fighting agent, sodium benzoate must be used with naturally acidic food or food that has been acidified. Sodium benzoate comes in granular or powder form and should be stored in an airtight container until you are ready to use. Add small amounts to dressings, beverages, pie fillings, etc. Only 0.1 percent is allowed in food products by law. You can find sodium benzoate at kitchen supply stores or wholesalers.